All the pictures in my previous post were taken with my cell phone, in part because I can be lazy to carry around my Canon 30D and also because I find it takes pretty good quality pictures. It also allows me to edit the pictures fairly easily. And there are several apps that allow for manipulating your pictures in various ways. I've begun seeing more and more of my friends using Instagram, and I'll have to admit, I was a little jealous when I realized there isn't an Android version. So I looked to see what Android does offer for photography apps that process pictures in a style that I like. 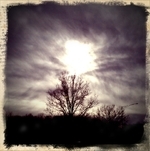 I found Retro Camera. And I have to admit that I've become minorly obsessed. I love the way the pictures look. I only wish I could apply the different looks after I took a picture. Here are sample images from each of the five camera models available. Click on any thumbnail to view a larger version. What's your favorite photo app?